If you have considered buying a property in France (Why buy property in France), the chances are that at some point you may have considered Brittany as a place to look for that property. The region is no secret from British property seekers, and it has long flaunted its not inconsiderable charms on the international property market. It is not overrun by ex-patriots, however, despite its enduring popularity. The Bretons themselves, proud people that they are, have no intention of moving away and leaving their beautiful region to anyone else to spoil. Instead they welcome us with typically warm Breton hospitality, take us to their hearts and guide us gently in the right direction so that Brittany remains unspoiled, strong in character and true to itself and its history. There are, seemingly, a million and ten reasons to purchase a property in Brittany, yet I must content myself with writing about just ten of them. The upside of this is that you can add your own to the list! Because most of Brittany is a peninsula, jutting out into the Atlantic Ocean, you are always within reach of the seaside, wherever you happen to be (Property near Sailing Ports / Marinas in France)! This means that everyone, even those on a tight budget for whom the seaside towns of France are usually out of reach, is able to buy a property that enables them to reach the sea in a short time... perfect for day trips and holidays! (The French Atlantic Coast from Biarritz to Southern Brittany). You might want to disagree with this statement, but chances are that you will just agree. If you have ever seen the amazing cliffs, the local stone of beautiful and unique pink granite, the islands, the sea birds and the brilliant colours of Brittany, you will find yourself hooked for life. Walkers (Finding property in the best walking areas of France) and cyclists (Cycling and motorcycling in France) alike say that Brittany is perhaps the best part of France for enjoying these hobbies, and who am I to argue? If you love the sea, and let's be honest, the sea is one of Brittany's finest attractions, you should take a good look at property in Brittany and at the beaches of Brittany. There are so many, some with their soft silver sands and natural windbreaks behind best suited to allow young families to enjoy them in safety, and yet others that provide exciting water sports and surfing opportunities for adventurous teens and young adults (Sport in France). Brittany's beaches range from sheltered, pretty little coves to expanses of windswept sands with breakers that take your breath away. There are peaceful harbours dotted with colourful fishing craft, and there are towering cliffs with fearsome drops to the sea slicked rocks below. 5. Brittany has a climate sent straight from the Gulf stream! Despite its status as a northern region of France, Brittany has a secret benefit. Much of the region is warmed and protected from the cold wild weather that can blight the rest of the north by a natural phenomenon known as the Gulf Stream Effect. This ensures that a lot of Brittany has a climate that is warm and sunny in the summer, and mild and frequently sunny in the winter. How perfect can it get? The warmest department tends to be Morbihan, so if you are a fair weather fiend then set your sail for southern Brittany and look for property there. (Weather in France). 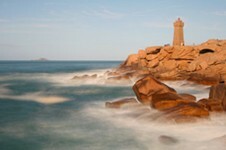 With its distinctive cuisine, Brittany really is a gourmet's paradise. The gourmet traditions here are quite different from other regions of France. You can try delicious freshly made crêpes, stuffed with the filling of your choice, sweet or savoury as the fancy takes you. Revel in the freshest seafood in France, having strolled down to the harbour to watch the fishermen bring it ashore, sell it to the restaurant owners and later settle at a harbour front restaurant to simply enjoy. 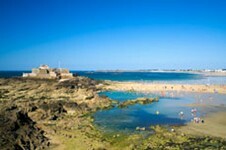 Brittany is famous for its oyster beds, its clams and whelks, its mussels and sea fish of all denominations. You must also taste the Breton galette, the delicious buckwheat pancake unique to this region, and many more amazing cakes and pastries that everybody's auntie has a different recipe for. Collect them all and choose your own favourite... you won't get bored trying them to decide which is best! (Buying and cooking French food). If you want a property in France to come complete with a genuine atmosphere born of a powerful and ever present history, then owning one in Brittany will not fall short of your hopes. There is evidence of its chequered past everywhere you go, whether it be the tragedies of the world wars, the buildings that tell the tales of the Hundred Years struggle, mediaeval towns and villages redolent of days gone by with their cobbled streets, Gothic churches and timbered houses. Then there are all the sea traditions of the region, which come together in a huge variety of festivals of song and dance that celebrate Brittany's dependence on and unique relationship with the sea. It is land of folklore and legend, a land where giants still roam... at least in the imagination, and in the ancient ceremonies of the Pardons that proliferate in Brittany even today. The towns and villages of Brittany in all the departments are jewels in themselves, whether or not they rejoice in sea views. If you want atmosphere to die for, try looking at property in Dinan (Dinan Property Guide), a gorgeous mediaeval town lying in the north of Brittany, in the department of Côtes d'Armor (Côtes-d'Armor Property Guide), complete with authentic battlements, cobbled streets and half-timbered houses. If you want to lose yourself in the atmosphere of the wild Atlantic foam, you could do worse than consider property in Finistère (Finistère Property Guide), with the town of Crozon (Crozon Property Guide) having a particularly spectacular setting. Then there is Vannes (Vannes Property Guide), in the Morbihan department (Morbihan Property Guide) of southern Brittany, complete with history in bucket loads. Here you can find delightful and eclectic architecture which, unusually for northern France, survived the ravages of the two world wars almost unscathed. Even inland, or as inland as Brittany gets, in the department of the Ille-et-Vilaine (Ille-et-Vilaine Property Guide), which lies in Brittany's east, there are some truly delightful towns and villages where you could look for property set in lovely countryside. Brittany is a perennial favourite with holiday makers, and this shows no sign of changing as the years go on. It presents, therefore, a wonderful opportunity for those who want to own property and also earn a living in France (Jobs in France), and who like the idea of running gîtes, hotels or B&B establishments (Owning Gîtes and Chambres D'Hotes (B&Bs) in France). There are many other opportunities too, connected with the tourist trade in Brittany, and among these are horse-riding establishments (Horses in France), sailing schools, cycle hire businesses and many, many more. Let your imagination be your guide, and turn your passion into a business idea to run from a lovely Breton property. If, for example, a residential course in ceramic pottery is successful in Stoke on Trent, how much more attractive a proposition does it present if it takes place in a quaint Breton village with the Atlantic Ocean as a backdrop? Property in Brittany is not necessarily the cheapest (Cheap French Property) that France has to offer as the attractions of this lovely region are far too great for that, but it almost inevitably proves to be a sound investment. This is because not only does everyone love Brittany, but because God, in his wisdom, has decided not to make any more of it... thus keeping the laws of supply and demand working in your favour, once you have become an owner of a Breton property! Brittany is a limited edition... so make the most of your chance to buy now! Brittany Property | © 2005-2019 Financial Systems Limited and its licensors. All rights reserved. | No unauthorised use of content permitted.